Osseointegration is defined as the direct contact between living bone and the surface of synthetic (often titanium based) implant. There are procedures now that employ osseointegration to vastly improve the quality of life for amputees. An internally fixated endoprosthesis anchored to the bone is connected through an opening in the stump (stoma) to an external prosthetic limb. 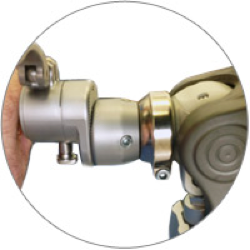 The socket is not required and the prosthesis is attached to the body via a torque controlled knee connector.